It was England's batting that let them down in Perth, but it is the state of their bowling that will give Andrew Strauss and Andy Flower the greater food for thought in the build-up to the Boxing Day Test in Melbourne. Speaking in the aftermath of a series-levelling defeat, Strauss insisted there would be no knee-jerk reactions, but hinted nevertheless that changes were on the cards for the MCG, as an intense campaign takes its toll on England's resources. 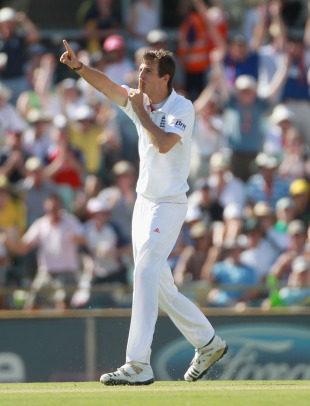 Despite an impressive return to Test cricket for Chris Tremlett, whose eight-wicket haul included a career-best 5 for 87, there were jaded performances from the remainder of the seam attack - in particular Steven Finn, who looks in need of a rest - and an anonymous one from their trump card, Graeme Swann, who came off a distant second-best in his latest duel with Mike Hussey and bowled just nine expensive overs in the second innings. While Swann's ineffectiveness can be put down in part to the vagaries of the WACA wicket - a surface on which even Shane Warne failed to claim a five-wicket haul in 12 visits - it had a knock-on effect on the remainder of the attack, with Australia scoring their runs at more than three-and-a-half an over in both innings, compared to rates that barely exceeded three an over on the more placid surfaces in Brisbane and Adelaide. The most culpable bowler in that regard was Finn, who claimed a further five wickets in the match to cement his position as the leading series wicket-taker with 14 at 33.14, but who conceded 183 runs in 36 overs all told. Despite showing immense promise at the age of 21, he currently lacks the experience and conceivably the stamina to last the distance in a five-Test series, and he could well make way in Melbourne for the sturdy Tim Bresnan, who proved in Bangladesh that he is an asset on unresponsive wickets, or the more explosive Ajmal Shahzad, whose particular penchant for bowling at left-handers could be useful in dislodging Australia's main man, Hussey. "I wouldn't think there will be wholesale changes because it's not a time for panic, but I certainly wouldn't rule anything out at this stage," said Strauss. "We have played a lot of good consistent cricket over this tour so far and we're going to need to do something similar in these last two matches. It's all about bouncing back now. We've done it well in the past and we're going to have to do it in Melbourne. "We have a got a few days to take stock of the situation," he added. "There are definitely lessons to be learned from this game, it would be wrong for us to wash our hands of it completely. But our intensity in the field was pretty good and the bowlers for the majority of the time did a very good job. Bowling Australia out for 260 and 300 on a pretty reasonable wicket was a decent effort." One character whom England most certainly missed was Stuart Broad, who tore an abdominal muscle in the closing stages of the victory in Adelaide, and whose tally of two wickets at 80.50 did not do justice to the hostility and control that he brought to the attack in the first two Tests, in which time his economy rate was 2.30, the best by any bowler on either side. All things being equal - and to judge by England's pre-match comments - both he and Tremlett might well have played here, with Finn missing out on rotation, but Strauss rightly refused to be drawn into "what ifs". "I think Broad would have been very effective on this wicket but unfortunately he was injured and there is no point crying over spilt milk," said Strauss. "Chris Tremlett came in and bowled outstandingly well, I thought. His hostility all through the game was there to see, batsmen didn't enjoy facing him. He grabbed his chance with both hands so I'm delighted for him. But to win Test matches you need 11 guys to perform, not just one or two." After a fortnight in which his own team's bowling issues had been scrutinised in minute detail, Ricky Ponting was glad to be able to pass some of the problems over to England. "I think England will now be starting to have a bit of a look at their team make-up and the sort of cricket they have to play to beat us," he said. "Broad has been an important player for them for a couple of years," he added. "He is their most hostile bowler and would have enjoyed bowling here, although Tremlett was probably the pick of their bowlers, so it was going to have an impact on their team. But we have played Swann particularly well. He bowled well in the second innings at Adelaide, but that was on a pitch that suited him." Given how integral Swann has been to England's recent upsurge in fortunes, it is inconceivable that he will be kept this quiet throughout the remainder of the series, especially when one considers how quickly he bounced back from some rough treatment in the first Test at the Gabba. "He understood the situation, that's the way it goes," said Strauss. "Sometimes he will be very effective, sometimes less so. The great thing about him as a bowler is that he's proved over the last two years that he's going to be a threat more times than not. "There was nothing in it for the spinner," added Strauss. "He did well to get a couple of wickets in the first innings but there was no turn, the ball skidded onto the bat pretty well. In those circumstances, it will always be difficult for a spinner to exert any sort of pressure. Australia played him well and positively. But the remaining two wickets in the series should suit him more than this one." England's other major talking point is the positioning of Ian Bell in the batting order. Despite the loss of five wickets in less than 50 minutes on the final morning, Bell once again looked the classiest batsman on show as he stroked a range of cover-drives before falling lbw for 16, the first time he had failed to reach fifty in the series. With Paul Collingwood looking horribly out of sorts with his series tally of 62 runs at 15.50, Bell needs to be given more of a chance to make a positive impact higher up the order, rather than being left to milk his runs with the tail. Strauss, however, said that there had been no thought given to promoting him in the second innings of this match, despite England losing five wickets on the third evening, including Collingwood for 11 to the last ball of the day. "We have got to keep perspective about things and realise there has been a hell of a lot of good batting on this tour so far," he said. "We have no reason to expect that to be any different going forward."